Pharmacy began in Van Diemen's Land with the supply of medicines by military surgeons and dispensers. As the number of free settlers grew, traders with 'chymical knowledge' brought in shipments of medicines and chemicals. Gradually, qualified chemists and druggists settled and began independent businesses. The first was Michael Bates who, in 1825, established a business as 'Pharmacopolist, Chemist and Druggist' in Launceston. This became Hatton & Laws Chemists, one of the oldest pharmacy businesses still operating in Australia. Chemists were licensed by laws enacted in 1837, 1840 and 1842, which protected them against competition from charlatans and restricted the selling of medicines to chemists and doctors. Training of chemists was by apprenticeship to a 'master chemist' for three years, but educational standards were difficult to maintain, as chemists in the north and south were separated in small populations, and new knowledge came only slowly from England. Better contact with the other colonies helped to improve standards and stimulated the formation of the Pharmaceutical Society of Tasmania in 1891. A major proponent of the Society was HT Gould, who had established the H.T. 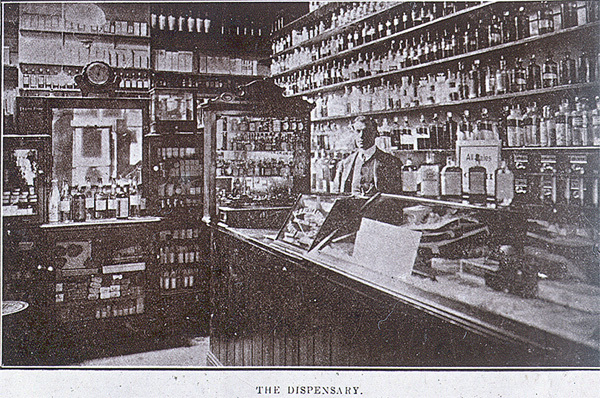 Gould & Co. Homeopathic Pharmacy in Hobart in 1881. Gould's Pharmacy continues, still selling homeopathic medicines. The Pharmaceutical Society took over the examination and licensing of chemists from the Medical Examiners, and appear to have begun lectures at the Hobart and Launceston Technical Colleges in 1891. Formal separation of medicine and pharmacy came about when the Pharmacy Act was passed in 1908. Most medicines were compounded mixtures of natural ingredients until the early 1900s, when the advent of patent medicines and manufactured tablets such as aspirin and phenacetin began to broaden the range of drugs. The synthesis of antibiotics and antipsychotics revolutionised drug treatment in the 1940s and 1950s. Training continued to be by apprenticeship, until in 1960 a further leap in educational standards became necessary. Pharmacy became a full-time course at the Hobart Technical College, and the School of Pharmacy was set up in 1964. The School was included in the Tasmanian College of Advanced Education which provided a three-year degree course from 1972. In 1978 Pharmacy moved to the University of Tasmania, where it came to be ranked as one of the best pharmacy courses in Australia. Further reading: J Finch, Pill, potions and politics, Hobart, 1991; G Haines, Pharmacy in Australia, Sydney, 1988.